The path of expulsion being considered by my colleagues will have major implications for the Senate of Canada. This is a constitutional fight in which I will not engage. Let me put his doubts to rest: if Meredith had not decided to resign, the Senate would probably have expelled him and thereupon made his seat vacant; there would have been no “constitutional fight” in he could have engaged himself. The Senate’s decision would have been final because the Senate alone decides upon to discipline its members by virtue of its collective parliamentary privilege as a legislative body. There would have been no appeal. The law courts have no jurisdiction to adjudicate upon the Commons’s or Senate’s decisions to discipline their members. The law courts are only competent to acknowledge or refute the existence of specific parliamentary privileges, not to adjudicate how a duly constituted legislative body exercises them. Meredith has announced his intent to resign, but he must follow the procedure under section 30 of the Constitution Act, 1867 in order to promulgate his resignation into effect. 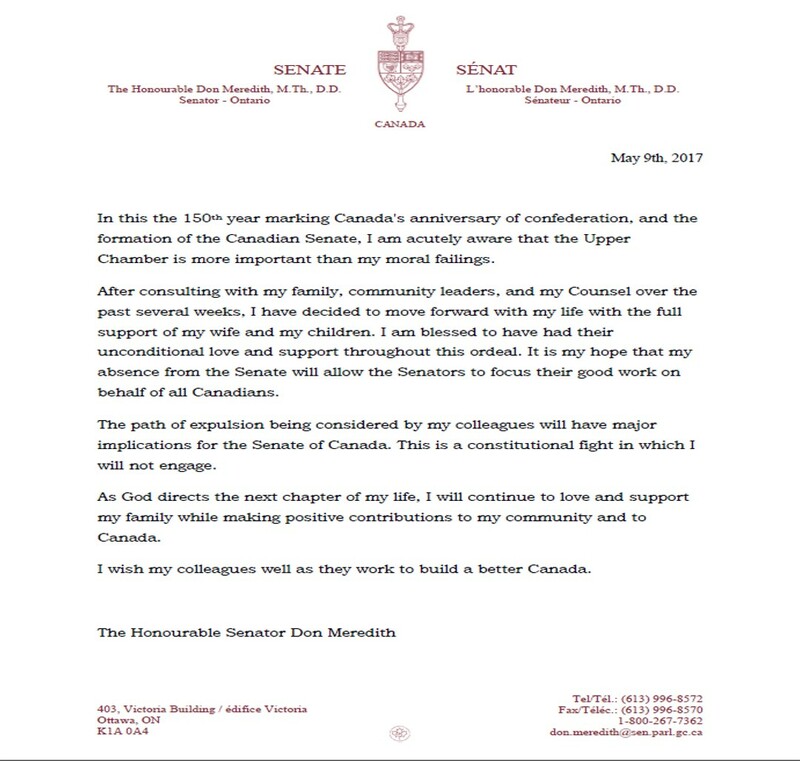 The Globe and Mail has reported that Meredith’s lawyer informed Rideau Hall that Senator Meredith would soon tender his resignation to Governor General Johnston but that Rideau Hall has not yet received said letter. The aforementioned and hyperlinked statement does not fulfill the requirements of section 30; it does not even include the word “resign”, it is not addressed to the His Excellency the Governor General, and it makes no mention of section 30. The Manual of Official Procedure of the Government of Canada states: “A senator resigns by letter addressed to the Governor General. 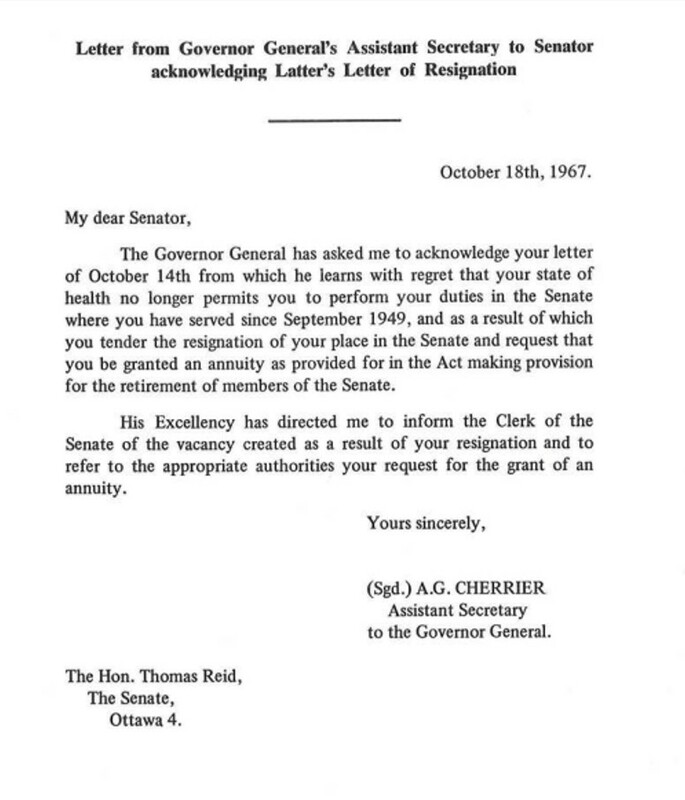 The seat is considered vacant upon receipt of this letter by the Governor General.”  Furthermore, “When the Governor General receives a letter of resignation from a senator, Government House informs the Clerk of the Senate that the seat is thereby vacant,” and the Governor General also replies back to the former Senator acknowledging receipt of his resignation letter. 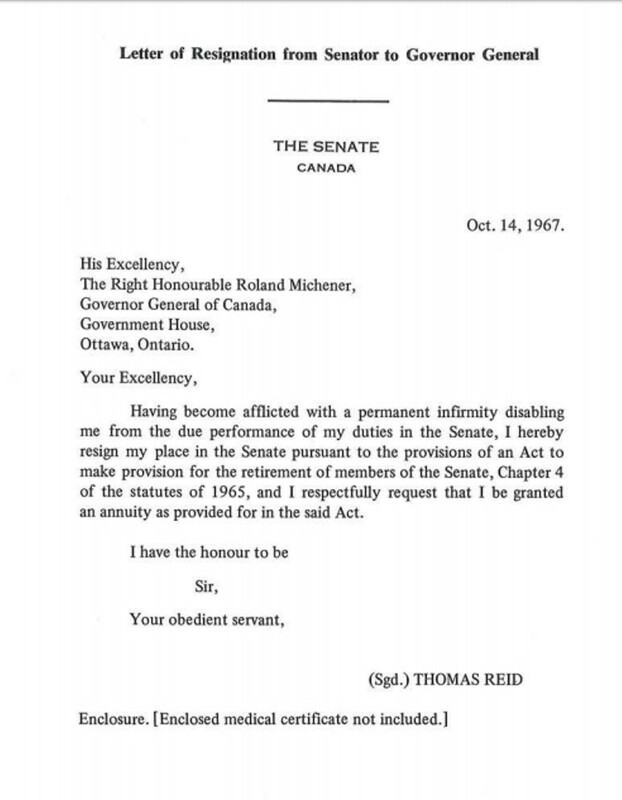 In this example, Senator Thomas Reid triggered Section 30 and resigned his seat in October 1967 due to poor health; the Governor General’s Office acknowledged receipt of his resignation four days later. Meredith’s resignation would therefore take effect once the Governor General acknowledges receipt of Meredith’s formal and proper letter, whenever that occurs. His place in the Senate would become vacant, and Prime Minister Trudeau would then be free to nominate a new Senator for Ontario. Canada, Privy Council Office, Manual of Official Procedure of the Government of Canada, Henry F. Davis and André Millar (Ottawa: Government of Canada, 1968), 527. Ibid., 529; Canada, Privy Council Office, Manual of Official Procedure of the Government of Canada: Appendices, Henry F. Davis and André Millar (Ottawa: Government of Canada, 1968), 779, 781. This entry was posted in Parliamentary Privilege. Bookmark the permalink.